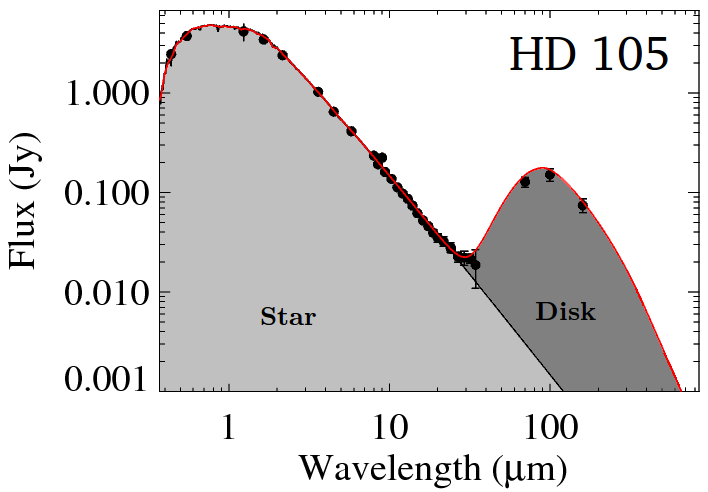 Light emitted by the star HD105 and the debris disk orbiting it. From Donaldson+ (2012) — http://adsabs.harvard.edu/abs/2012ApJ…753..147D. Great talk today from Jessica Donaldson of University of Maryland Astronomy about observing circumstellar debris disks. These disks represent the fragments from collisions between rocky bodies, themselves orbiting the star and some of which go into forming planets around those stars. Light from the stars heats the dust, and so it emits infrared (IR) radiation that astronomers can distinguish from light emitted from the star (see figure at left). By studying this IR emission, astronomers attempt to understand how far the dust is from its host star and whether it is in the places where astronomers expect planets to form. The emission can also tell us about the composition of the dust. Donaldson described her work refining techniques to tease that information out of datasets collected by the Spitzer and Herschel spacecrafts. Her work has suggested, for example, that the dust observed around some stars has a composition similar to that observed in dusty comets orbiting the Sun.